Treats for the Entire Family! We all a good treat once and a while and your furry family members are no different. 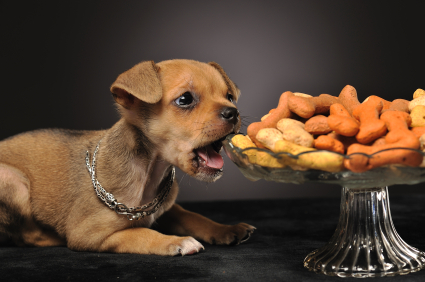 Please keep in mind that most human treats that are served around the holiday season or any gathering such as chocolate, certain nuts, and fatty treats, can cause harm to your pet. For this reason, here are some healthier recipes options for your dog. Use them as treats, or gift them to your dog-loving friends! In a bowl, combine the flour, baking powder and egg. Then add the peanut butter, water and honey and stir to the consistency of a firm yet sticky dough. On a lightly floured surface, roll out the dough to half an inch thickness. Use cookie cutters to make fun shapes. Place cut cookies on a cookie sheet and bake for approximately 20 minutes until golden. Preheat oven to 300 degrees F and line baking sheets with parchment paper. Combine dry ingredients and mix thoroughly. Combine wet ingredients in a separate bowl and mix thoroughly. Slowly combine wet ingredients to dry ingredients while constantly mixing. Use hands to knead the dough. Roll the dough out between two pieces of parchment paper to a quarter inch thickness. Remove one piece of parchment paper and flip dough on to a counter top that has been lightly dusted with brown rice flour. Remove other piece of parchment paper and cut fun shapes for cookies. Place these shapes on to your parchment-lined baking sheet. Bake for 30-35 minutes. Once baked, turn the oven off and leave the cookies in the oven to cool in order to make them extra crispy.